I do not feel like experimenting because I do not deconfigure. How to use the native AW overclocking? I have no idea how to do it. I know that if I frame it, the aftherburner configuration is unchecked, but I do not know anymore. Do they serve the same profiles that I already have? The Awesome Miner overclocking works very similar to the Afterburner overclocking feature. As you notice you just have to enable it via the Options dialog and then it's being used automatically. The GPU properties you can adjust may be a little different depending on what card you have if you compare Awesome Miner and Afterburner, but in general you should be able to use the same clocking profiles like before. As this feature is currently in a Development version right now, the documentation on the web site is not yet updated to reflect this new feature. Even if I use the AW version, can I leave the Aftherburner installed in the rig, without the MSI SERVER, just to see the OC applied by AW? does not interfere with having Aftherburner installed? It's no problem to leave MSI Afterburner installed. You can switch overclocking provider in the Options dialog as many times as you want. I just did a test in a small rig. I have stopped MSI SERVER and in AM I have put the OC to be awesome miner. I have forced several changes of something with different OC but in the rig the OC has not moved. I have left Aftherburner installed to know if the OC changes. When I finished testing I went back to the usual with MSI SERVER and changed to AM and left it as usual. That rig gave me problems, I had to go to the GPU and do the Mapping of the GPUs again to make it work. As you said no info in your documentation please post the link here when you update it. I would like to use the most stable system. Sometimes the MSI SERVER stops working and you have to change the name of the folder in all the RIGS. Right now I'm still with Aftherburne and MSI SERVER until there's more information on how to use your new OC version correctly. I've updated the documentation page for GPU overclocking. It also contains information about how to troubleshoot if needed. Please note that for several of the OC settings, it's not possible to use MSI Afterburner to detect if it's applied correctly. For some settings, MSI Afterburner must be restarted for the new settings to show up and for a few other settings MSI Afterburner have it's own way of reading/setting clocking so any changes you define using other applications will not show up. For this reason I pointed out in the documentation that you should use the Reload-button in Awesome Miner to verify the settings. I uninstalled and reinstalled the remote agent, but I still have the issue. I'm running nvOC 19.30 (Ubuntu 18.04), btw. I like this distro since it is all setup for mining out of the box and has a bash file where I set the GPU clocks and power. If there's another distro that provides basics I need, I'm not opposed to give that a go. What Linux distro do you guys use with AM? EDIT: Did a clean install of Ubuntu 18.04 LTS Server and after getting it all setup with the latest drivers, etc, I installed the remote agent. Getting the exact same errors as on the nvOC distro. I assume you only have one single Host for this Linux miner defined in the Options dialog, Managed Hosts section. This host must have the "Linux" checkbox active and there shouldn't be any other hosts in the list connecting to the same computer. Can you verify this? Can you also review the Awesome Miner application log file for any error message about this connection problem? I know that a number of users have been running Remote Agent on HiveOS. I will however give nvOC a try to see if I can reproduce the problem you point out. I started to realize when I noticed that some miners gave me an error. This happened because I have an OC for 2070 wild memory (+850) that the 1070ti can not support. The fact is that when the OC was activated for 2070, the 1070ti gave error by hanging the miner. At the beginning I tried using the AB OC, since I have OC profiles in curve mode for the Core, that is, the AB allows you to create curved profiles for the different memory sets, so if your card is stable to +500 mem with Core +200 in power 70%, it is possible that with power 100% it is not, and these curved profiles allow you a stable OC setting only Mem, and vary the Core according to the Power that you set. The fact is that in the first tests, I left without clicking the Core, so that AM respected the core of the AB. The result is that when activated in a defined algorithm, it is respected, but at the same time the value is fixed in the AM, so in successive Oc profiles in AM, the core is fixed in advance, not respecting the changing value of the OC curve. I do not know if I explain myself very well. This last one is the reason why I have rejected to do OC with the AB and to put myself with the native one, finding the problem exposed to me first. Thanks for taking the time to try out this. The Clocking Profile concept will be redesigned soon. The difficulty is that depending on which GPU you have, the clocking properties are different. Some cards support Target Temperature while others don't, and so on. By forcing you to setup a Clocking Profile based on what a specific card supports will make sure you don't try to set properties that isn't supported. Please note that as soon as you save the Clocking Profile, it has no link to the specific miner or GPU, and it can be applied to any miner and and GPU. If you try to apply it to a GPU where a property isn't supported, that specific property will be ignored. Just like before when you used MSI Afterburner, you have to define a Clocking Group if you have a mix of GPU types and want to specify a unique profile for each GPU type. The curve you are referring to, I assume it's the one in the "Voltage/Frequency curve editor" inside MSI Afterburner? Awesome Miner doesn't support this VFC feature yet but it's on the todo-list. What is your Bminer url in the options> managed software> BMINER panel? This requires CUDA 10 and I have not used this version since not all my rigs are migrated to the CUDA 10 drivers. BMiner doesn't require the algo input parameter and thus the screen says you're unable to configure command line arguments in the said screenshot. I beleive it just negotiates and choose the algo automatically when connecting to pool stratums. -> Share the output of the diagnostics and see if anyone can pickup what might be wrong if it's not trivial. Thanks for sharing all good points above. I just wanted to give a short comment about why Awesome Miner don't have the algorithm names listed in the Managed Software dialog for Bminer. For most mining software you have a concept of a command line argument specifying the algorithm, for example "phi2" that will give the result "-a phi2" for example. Using the Managed Software dialog you can customize this per algorithm to make it "phi2 -I 15" resulting in "-a phi2 -I 15". For Bminer you don't have a separate command line argument for the algorithm name, instead it's part of the generated URL parameter that looks something like "cuckaroo29://username:password@grin29.f2pool.com:13654" where Awesome Miner automatically set the part "cuckaroo29" based on the algorithm you have for the pool/coin. As the algorithm argument is part of the URL with Bminer, it's not possible to simply add additional command line arguments to it with the current design. Yes, I only have a single host defined for this specific miner. I did have a windows hosts defined previously that I deleted and replaced with the nvOC based one. But this was also the case for the first rig that I converted from Windows to nvOC. One note on this is that I had to restart AM before it would "pick up" the first rig that I switched from windows to nvOC. And yes, I do have the "Linux" checkbox checked. How do I access this log? Also, will setting GPU clocks, power levels and fan control be a future option for the Linux remote agent? btw, I really like the recently added native control of these with the windows version. So much simpler than having to use the Afterburner remote agent. One thing I found is that I had to re-create my GPU Clocking Profiles as the old ones did not include the temp target values. Unrelated issue. I've got 3 rigs with 1060 3GB cards mining BEAM using GMiner. Since the Equihash 150.5 algo requires just shy of 3GB of VRAM, I'm running those rigs on HIVEOS for now. I'm monitoring then from AM as External miners by looking at port 42010. This works fine except the earnings are not showing up. When I right click and "Define coin for pool", I select BEAM. However, nothing is showing and if I go back to "Define coin for poo"l again, it has reverted back to BTC. Also, on these External miners, when I click on the Pools tab, it shows the Grin29 pool my managed miners are connected to, not the BEAM pool these miners are actually mining on. On my Managed miners, I can of course select the pool each rig is mining on, but for External rigs, this is not possible. I do see the GPUs and hash rates as AM is picking that up from the GMiner API. I don't know if something changes, but I seem to recall AM being able to show earnings for External miners in the past. Hello Patrike, and thanks in advance for your attention. I understand what you tell me and this is how I have done it. I explain it better. I have two GPUs, one 1070 and another 2070. I create an OC profile and apply it only to some algorithms of the profit profile 1070. What I am saying is that when the OC is activated in profile 1070, it also applies in profit profile 2070 (and in this case it is clean of OC in the AM). When the OC is activated, the OC is applied to the two profit profiles and therefore to both cards and to both miners, when it should not be so, it should be applied only in the profit profile 1070, right? At least in my case, so I do not know if I'm missing something in the configurations. Regarding the second theme, yes, the curve I am referring to is the one in the "Voltage / Frequency curve editor"
Did you tried Clocking Profile Groups like patrike mentioned? I think (might be wrong) you'd need that even if you separate the miners. how add cpuminer-opt to whitelist norton antivirus ? To verify if the GPU settings were applied successfully, use the Reload button in the GPU settings dialog to reload all properties from the AMD and nVidia GPU drivers. If one or more settings didn't have the expected value, please report which GPU model and which setting that didn't work together with the Awesome Miner log file. Do not use the MSI Afterburner application to check if the GPU settings were applied successfully. 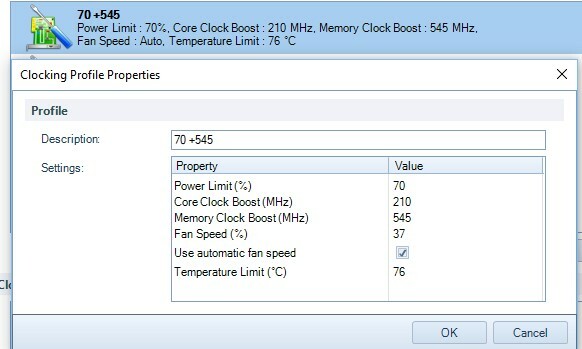 MSI Afterburner uses different overclocking concepts than other applications and may not display the current GPU settings correctly when set from other applications. I have done a test and I do not see results. On one side of his help he says that you have to reload or update to see if the changes are reflected. I could leave a capture of that menu, sometimes the translations are not perfect. If the native mode is not compatible with the RTX fans. How do we control them? Do they only go by car? For me the important thing is to know if the OC changes are applied using the native mode, but I do not identify which part of the program I have to give to see the changes, I would appreciate a capture. Now I have been seeing that if it is true that it does not need to include the -al-go in the miner's configuration. In fact it works for me with many algos, but when I tried it it was with tensory and there if it is true that it does not work, I suppose it will be the miner's own fault. The Awesome Miner log file can be found via the toolbar Tools -> Log File. The latest development release of Awesome Miner includes GPU clocking and fan speed changes on Linux as well. This will be part of the public 6.2 release, planned to be available in a few days. Thanks for the nice feedback on the Native Overclocking feature. The main purpose is that it should be easier to use. Your observations about which GPU properties that are available via MSI Afterburner and Awesome Miner may not always be the same - depending on which GPU's you have. In general you should be able to view the mining income via External Miners as well. I just did some tests with Gminer here and I could see the issue you describe. The problem is that Awesome Miner didn't report any pool in this case, resulting in that the Pools tab wasn't updated correctly when you select the miner and the Define Pool Coin didn't work either. A solution will be available in the next release. Thanks for finding it. Just to clarify, it's no problem at all to have MSI Afterburner installed at the same time as you use the Native Overclocking in Awesome Miner. The point is that MSI Afterburner works a bit differently than other overclocking tools you will find, and even if an application correctly set some GPU properties and clocks - there are scenarios where MSI Afterburner simply doesn't show all these changes in the user interface. For this reason it's very difficult to use MSI Afterburner to verify if specific clocking settings have been successfully applied or not. When testing and doing troubleshooting, it's typically better to use the "Reload" button in Awesome Miner. When you click this one Awesome Miner will forget about all GPU properties and read all the values from the nVidia/AMD driver API's again. If the clocking properties show up correctly after a "Reload" it's a good indications that they have been set correctly. 3) If you want to verify, click the Reload button. Awesome Miner will ask the nVidia/AMD drivers for the current settings and display them. You can also find many GPU related properties via the new "GPU Report" button in the Diagnostics dialog. I will also add this button to the GPU settings dialog in the next release. This one will be really good for seeing all GPU properties. For RTX-2000 fans, I think MSI Afterburner is the only application that can modify it right now and they must have some secret way of doing that. I don't think any other OC application can modify the fan speed of RTX cards yet as the nVidia driver API reports that it isn't supported and prevents it. The plan is of course to try to find a way to support setting fan speed on these GPU's as well. The other problem is RTX, if it is not able to handle the fans, what happens? Use the auto factory curve or change that speed even if it is auto. @patrike, I have a little problem. I leave you a capture so you can see that by configuration I added the coins per day. The problem is the following. When I change the profit in a currency, this is reflected in the daily profit, even in coins that you recently included. But the coins per day do not change. It does not matter if I put 0.7 that the 1.5 coins per day that I calculate do not change, I understand why the profit factor does not affect the formula for the stamping of coins a day. For me it is important, because when measuring pools / currencies to know their real profit and then put the resulting profit, this is not reflected in the currencies per day. Please could you tell me how to improve the configuration line or that you fix it in the next update. It does not make sense for a currency to put a profit of 0.80, effectively falling into the daily profit, but the coins remain the same. My recommendation, in my ignorance, is that it would be more appropriate for the PROFIT factor to affect the HASH, in that way it will affect the price and the coins per day. Right now the Profit Factor is applied after calculating the number of coins, to increase/decrease the revenue and profit of the coin. A better way of viewing it is to increase/decrease the number of coins you get per day like you point out. I will update the next release for this to at least consider the Profit Factor of a coin. It will unfortunately be a bit complex if you also consider the Pool Profit Factor here, but I will take a look at what is possible for that one as well. I am impatient waiting for an update with the correction of the currencies .... It is important that the profit affects the currencies day. I am realizing with grin, where I estimate 7.4, it does not matter what elprofit I put, and I get around 4.8, if my profit of 0.80 were applied, it would be close enough. But now it is difficult to measure pools / coins without that correct information. There is no need to click the Reload button all the time - it's mainly intended for reloading all data you currently see in the GPU settings dialog for troubleshooting purposes. You can always open the GPU settings dialog to view the current clocking properties. For the moment, the Native Overclocking will not touch the fan property on RTX cards. If you have them on "auto" speed which is the default, they will remain at "auto" even when you use Awesome Miner. 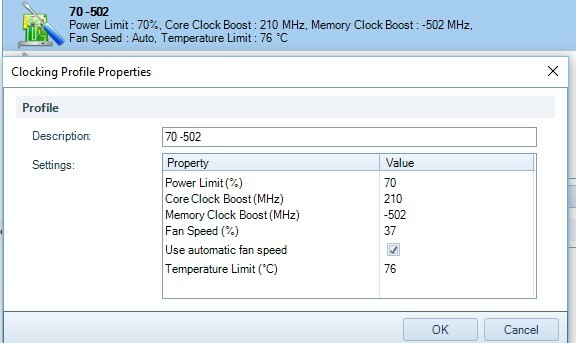 If you used any other application to force a specific fan speed, that specific fan speed will remain. The plan is of course to resolve this limitation. There will be a new development version available within the next 1-2 days where the change is included. Ok, everything understood. I have already changed all the equipment to native OC, it works very well and the change is minimal. I only had the doubt of where to look at the oc that had been applied, once I looked at it. I no longer have problems. MSI SERVER goes well but when it fails in 1 rig, you have to change the name and the folder and the task in all the machines. That was very annoying, it has already happened 12 times ..... I hope that with the native system everything is more stable. The only thing I'm going to miss, is to see temperature graphs, but I can live without that. Everything is better if you manage it AM natively, I do not do extreme OC, but I look for a configuration without exaggerating for each OC, now everything is much more controlled. Thanks for the nice feedback on the new Native Overclocking feature. I also have great news about the nVidia RTX GPU's - the fan control will very soon be supported. Once the implementation is ready and tested, it will be part of the next development release.